Job Tate is a veteran and a proud US Navy Seabee, currently serving with Naval Mobile Construction Battalion Two-Seven. Petty Officer Tate is a heavy equipment operator, explosives expert, squad leader, and combat warfare specialist who has served with honor and distinction at home and abroad — building vital infrastructure in some of the world’s most challenging conditions. Job has deep ties to our region. His family has owned a home in Benson for nearly a century. Job’s father is an evangelist and his mother has worked in the Emergency Department at Rutland Regional Medical Center for over 25 years. Job’s brother Joel, who lives in Chittenden, is a local pastor, and his sister-in-law is a librarian; together, they are parents to four of Job’s many nieces and nephews. Job loves to work hard, and over the years he has held several jobs in the area, often concurrently: security guard at Killington, customer service agent at the Rutland-Southern Vermont Regional Airport, the hospitality industry, disaster restoration expert, transitional living coordinator for heroin addicts — he’s probably even delivered you a pizza! This widely diverse work history puts Job uniquely “in tune” with the needs of those living and working in Rutland-Windsor-1. He understands your hopes and your needs. Job and his wife, Lisa, were best friends in childhood who lost contact for 20 years before finally reconnecting, falling in love, and marrying in 2012. This past January, Job and Lisa welcomed their son Mendon into the family. 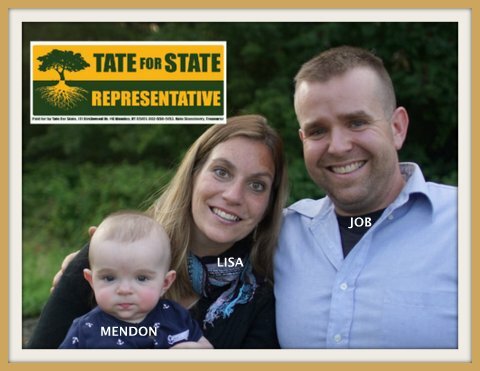 The Tates are committed to bringing optimism and opportunity back to our district and our state! Join the TATE FOR STATE team today!